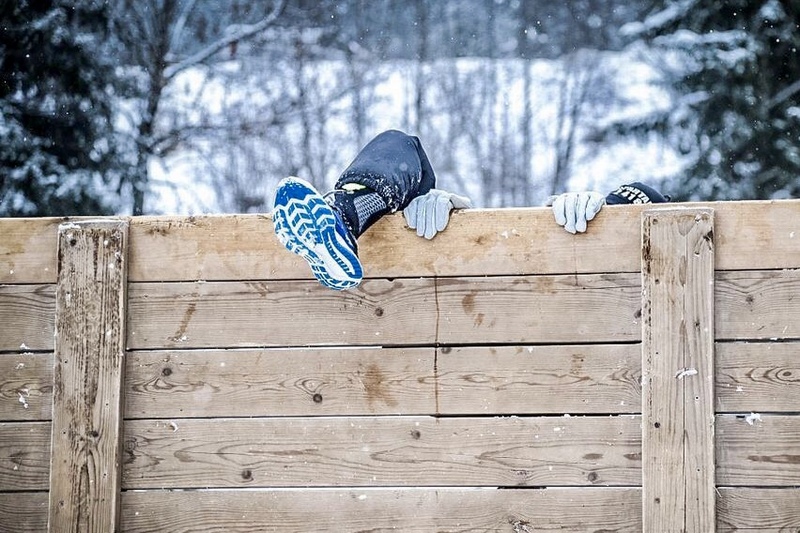 I wont lie – I like a bit of a challenge, but this may have been a bit too crazy an idea, even for me, and especially considering my modest fitness levels. It seemed such a good idea at the time ….. but then in my hazy recollection, there was gin involved! 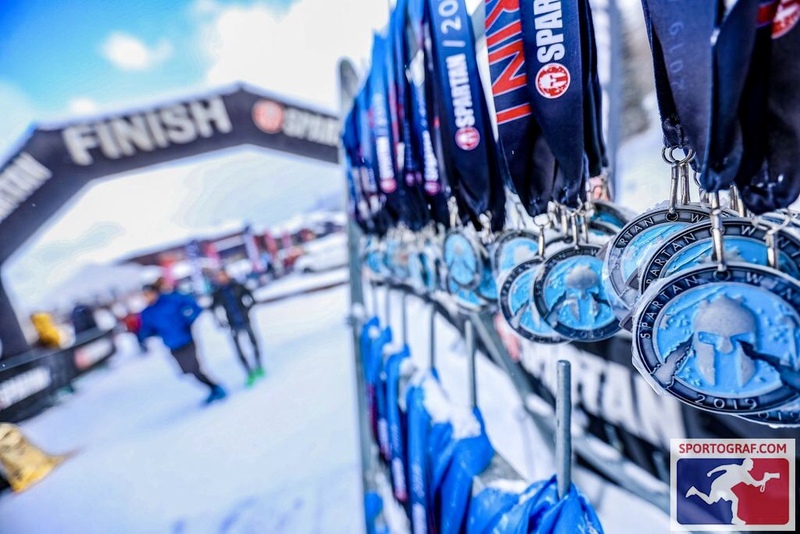 Each year I do a few Spartan races, which are essentially endurance obstacle races. I have done them in Paris, Marseilles and the Morzine Mountain version (the Beast last year nearly finished me off!). Therefore, one would think that when the winter version – in the snow and at the end of January – was mentioned to me, I would have the basic common sense to refuse politely. But no. Évidement I am clearly crazy – my husband Shep certainly thinks so! So at 6am on a very dark Sunday morning we are in the car creeping down the mountain on the way to Valmorel. My lovely family had “volunteered” to come and support me on my foolish endeavour. Mollie was chatting in the back of the car (“Mummy, are you sure I can’t do it too?”) and Shep was nobly driving whilst nursing his man-flu. “Are you absolutely certain you want to do this?” he muttered. Actually, no. After a good week of cold temperatures and sunny skies the weather had turned. We were wending our way through the Alps amid considerable falling snow. The sun-and-sparkly-snow photos that had so beguiled me of last years event seemed a world away from the lowering skies and driving snow outside. At the start-line I stripped down to my running clothes and hoped fervently that my ponderous jog would warm me up when we started. In a few hours it would all be over, and I would never have to do it again. The countdown complete, the smoke machines belched forth and we surged forwards, dodging the combative Spartan guards on the start-line – we were off! 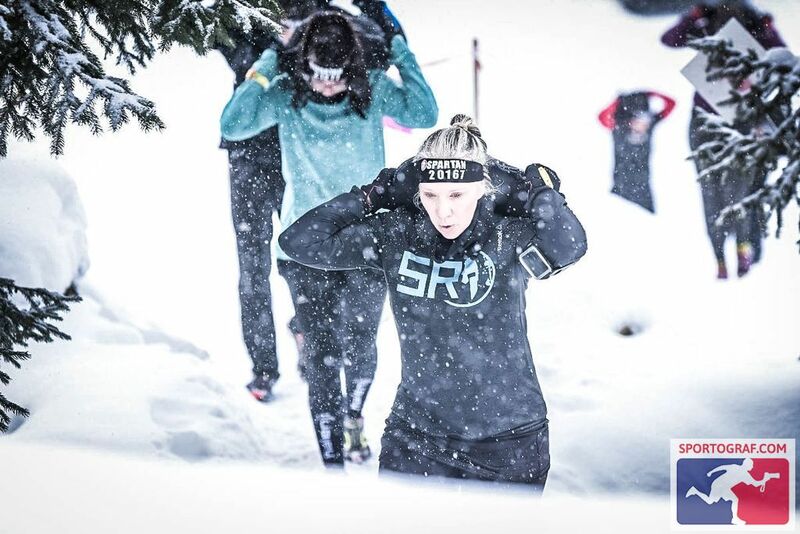 Conditions were tricky (but hey – Winter Spartan Race!) with falling snow and wind for the majority of the race, but my goodness, it was WONDERFUL!! 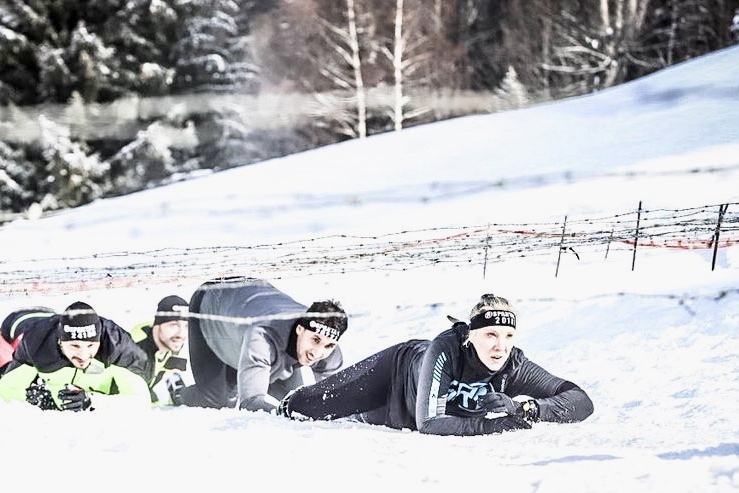 We ran down and (walk-jogged) up the mountain, scrambled over cargo nets, flipped tyres, hiked around carrying an assortment of heavy objects, crawled along barbed wire topped trenches, and navigated tunnels and storm drains knee deep in icy water and floating ice. Fellow Spartan competitors (at least at the non-competitive end of the event where I lurk) are almost without exception fun and supportive people to be with. They motivate when others are struggling, help each other over obstacles and share a joke along the way. Finally, we approached the end of the course, and finished with the spear-throw (burpees for me! ), by crawling under a couple of 4×4 pickup’s (their prop-shafts appeared to be in excellent condition! ), and the customary fire jump. By now I was feeling a little fatigued and dizzy (half a croissant at 7am not being an ideal pre-race breakfast) and so devoured the finish line snacks which included (in addition to the usual oranges, bananas, nuts and small buns) some rather excellent Beaufort cheese and well as – and somewhat magnificently – vin chaud!! 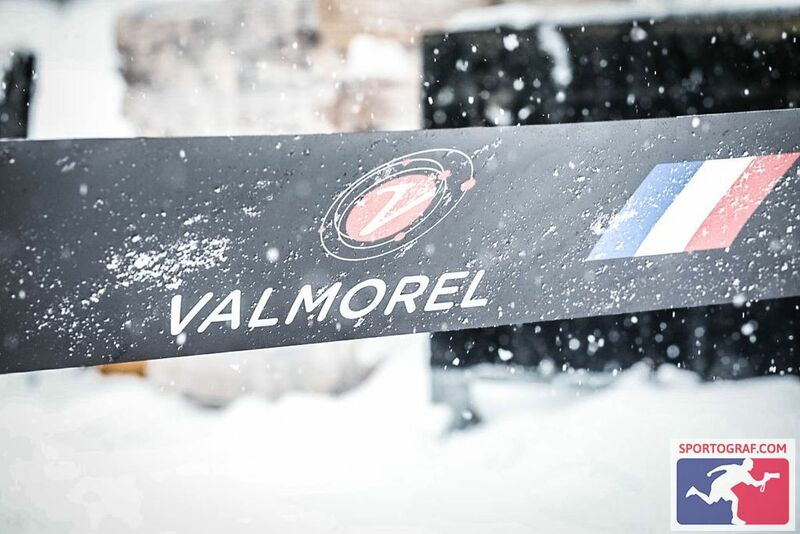 Chapeau Valmorel – I don’t mind if I do!!! 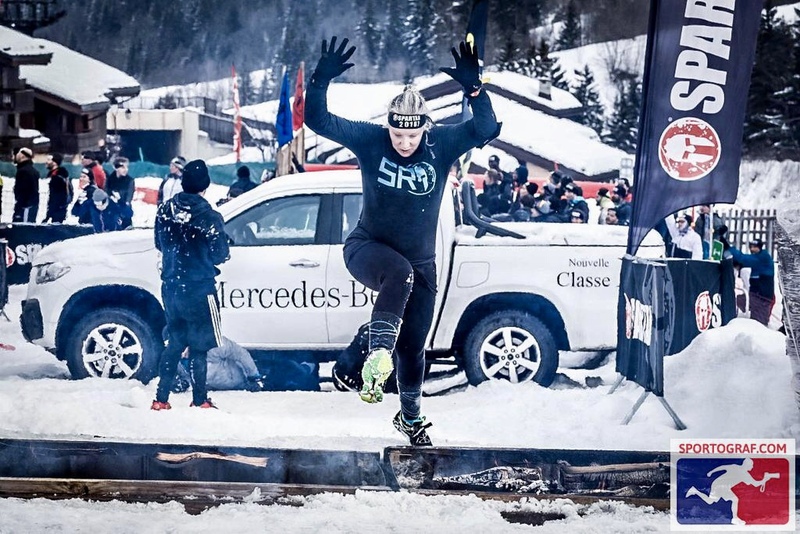 It was a fabulous and fun day out, brilliantly organised by both the Spartan Team and the Tourist Office and volunteers of Valmorel. I am also hugely grateful for the love and support of Shep and Mollie who cheered me on (the latter offering to help me with my burpees at the spear-throw!). So – does anyone fancy doing it with me next year???!!! !